A few months ago, it was secret shopping the University of Phoenix. As a librarian, I have a rather large beef with the University of Phoenix. Since all the classes are online, there is no physical school and no physical library. This, however, does not stop University of Phoenix students from needing a library, and they often come to me, the public librarian, and expect me to have materials to support their specific curriculum. They usually become unpleasant when I tell them that we do not have medical coding books, and do not seem to care when I explain that buying those books doesn’t really fall within the purview of the public library. As a secret shopper, I was all too willing to evaluate their level of customer service, particularly since their online nature meant I could do it from home in my jammies. So I filled out the online request for more information stating that I have no college education (the secret shopping company said I had to lie about that), and was interested in a B.S. in psychology. I used to want to be a psychologist when I was an angsty pre-teen, so I figured this was kind of a way to live the dream. After filling out the form, U of P was supposed to call me and we would further discuss how they could meet my needs. They were supposed to call me within an hour, but it didn’t happen. I sat there in bed awkwardly wondering what I should do with myself since I didn’t want to get involved with a project or book that I might have to abandon if they called. I was also a bit anxious about flubbing the script, so I re-read the guidelines for the secret shop about ten times, and waited by the phone which is a truly unpleasant experience. Finally after an hour and a half, I abandoned my waiting and went for a run expecting to come home to a voicemail–still nothing. So I spoke to a very nice man named Jason about my career goals and what the U of P could do for me. “What has your life been like with no college education?” he asked in a thoughtful and somewhat velvety tone. The secret shopping company had not warned me that this counselor would probably ask questions about my (fake) life, so I was very ill-prepared, but I think I pulled it off. This phone call happened four months after the initial one, and he was just following up (in a very concerned voice) to see why I hadn’t enrolled and started down the road to education and life improvement. As I’d already been paid, I really didn’t want to spend anymore time mulling over my fake life with Jason, but as I am far too nice, I told him that I’d gotten a new, better-paying job, and would consider college again in the future. “What are you doing these days?” he asked. “I have another call I have to take.” I told him and quickly hung up. Nowhere in my secret shopper agreement and terms does it say that I have to continue to play along four months after the initial transaction, but my Midwestern niceness dooms me to, well, niceness. I hope he doesn’t call back. How can you know you’re different unless someone else tells you? I’ve had people tell me for years that I should exploit my odd upbringing by writing about it. I’ve kind of done that with this blog, but I don’t think it’s in the way people intended. The first time I heard that, I was perplexed. I was raised in the upper midwest in a solidly middle-class, two-parent household in a small town–it’s seriously textbook. I wasn’t raised by wolves or by a traveling circus, or anything else that seems like it would make a compelling story. People kept insisting. People who didn’t know each other would tell me at different times that I needed to start writing stuff down. I kept wondering though, if what I consider normal is actually a bit odd, how the hell am I supposed to figure out what others find interesting? One of my writing professors went nuts for an anecdote that I told about how my parents tried to keep me from reading The Catcher in the Rye when I was in 7th grade. He’d bring it up at parties, when we were planning my class schedule–really emphatic. Since this is a man I revere, who basically made me the writer I am, you’d think I would have listened to him, but I really didn’t get what it was he liked about it so much. I used to read The Babysitter’s Club books religiously. I loved these books from the time I was in 3rd grade until actually two summers ago when I finally went back and finished the series. The library in my small town didn’t have the complete set, so I managed somehow to work out a borrowing system with a classmate’s older sister wherein he (classmate) would bring me five books at a time, I’d read those, then get five more. Aside from entertaining me to no end, and giving me ridiculous fashion tips that I never had the guts to act upon, The Babysitter’s Club often subtly made book recommendations. A character would occasionally mention a book that the kids she was sitting for enjoyed, or a book that she was reading. 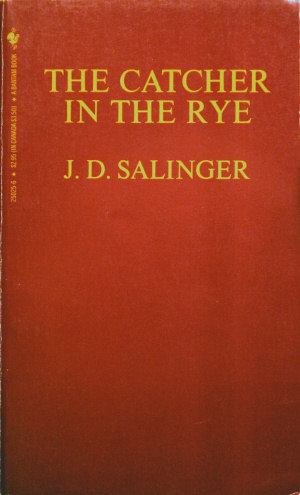 I made a point of reading every book they told me to, and one time it was The Catcher in the Rye. Stacy mentioned reading that book in Super Special #2–the one where they go to camp, and though I forgot about it for a few years, when I was in 7th grade I found it on one of my dad’s bookshelves. I started reading it, was fascinated by the amount of swearing, but felt like I didn’t really get it. Nonetheless, I was thrilled to be reading a “grownup” book, and pressed on. Eventually, my mother saw me reading it, and told me that she didn’t think it was appropriate for a girl my age. This baffled me. My parents had never commented on anything I read before, certainly they had never told me that I couldn’t read something, and by this point in my life, I’d already read some seriously graphic romance novels. Plus, Stacey in BSC had read and recommended it–what was the deal with Catcher? My Mom took the book away and secreted it on a shelf in the basement. As she was a terrible hider, I found it shortly after, and re-hid it in my room. Perhaps as a result of my spiteful nature toward being told no, The Catcher in the Rye became my go-to book. It was the book I would carry around with me everywhere I went (not an original habit, but I didn’t know that at the time) and read when I had nothing else that sounded appealing because it never let me down. I honestly don’t know how many times I’ve read the book all the w ay through because I’d usually just pull it out of my bag, pick a random page, and read until interrupted. The copy that I carried around for years was one that my dad had either taught from, or used as a student, and all of his underlining in green and red was in there. I made sport of trying to figure out why he underlined certain phrases and not others–I’ve never been a big underliner, or a good note taker so the behavior baffles me. I will never forget that he underlined, “I was feeling pretty horny” in red ink. When the book eventually started to decay, I patched it back together with Elmer’s glue as best I could. When I forgot that copy at home after going off to college, I went to the bookstore and bought a new version with a different cover. 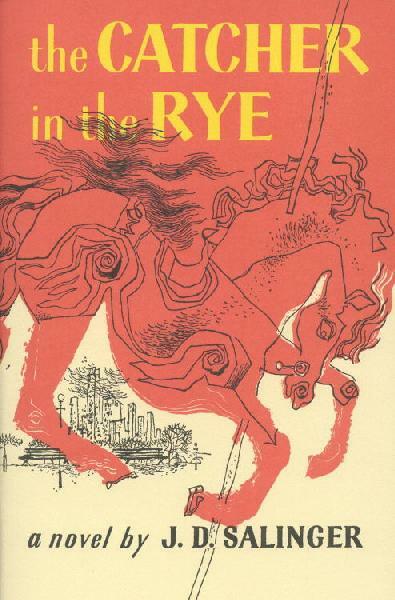 That prompted my best friend, Map Fleece, to start buying me copies of The Catcher in the Rye every time she saw new cover art, and now I probably own six or more various copies, but they’re all in storage in Minnesota. 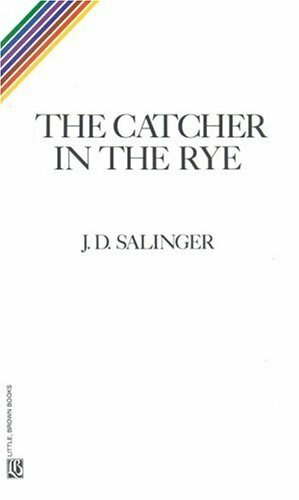 I haven’t read The Catcher in the Rye for years, and I’m almost afraid to because what if it’s not what I remember? I got into a fight with my father about the themes and symbols of the book once and remember thinking that he was a total moron, what if I come to agree with him upon re-reading it? It’s a dangerous proposition. Someone heard that original story–the reading, losing, stealing, reading– and found merit in it, which was completely unexpected. I still struggle with, and I think many other people either do as well or should do: what’s a story and what is not. I have a bit of an obsession with the memoir genre because I feel like everyone has a story to tell, but rarely are they capable of both recognizing the real story and relaying it in a way that makes anyone care. I compulsively read memoir looking for something powerful that’s rarely there. When it is, it’s incredible. That’s probably why I’m hesitant to write anything about myself outside of this self-indulgent blog. Blogging is one thing, it’s a soundbite, and you can quit at any time; memoir has the potential to be something bigger than the author and bigger than the experience. Plus, how do you know what your story is unless someone from the outside recognizes it, or unless you’re the type of person who can completely remove yourself and look back? I don’t know if that’s me.